I want to introduce you to this new drug going around. Maybe you’ve heard of it, or have some friends that dabble with it. Some kids on the college campus might be in on it. Or a few of your co-workers at the office get down on it a few times a week after work. Gains are everywhere these days, and the best part is- you make these so called “gains” all on your own! But I got to tell you, it’s quite addicting. You’ll get hooked on making gains. Before you know it, you’ll be all about the gains. All kidding aside, making gains isn’t rocket science. But it is a science. A lot of progress has been made in sports and exercise science over the last decade on what it really takes to build lean muscle mass. Guys have been getting big and jacked without the “science” behind it for years , but now we’re starting to understand the reasons for exactly why their methods were working. It’s been proven that there are quite a few essential requirements needed to see an improvement in your physique and weight training, a lot that can go unrecognized. But what are these requirements? Well lets’ lay out these requirements and you can see what it takes to really optimize your muscle building quest and start making some gains! Calories are king. There’s no arguing that. 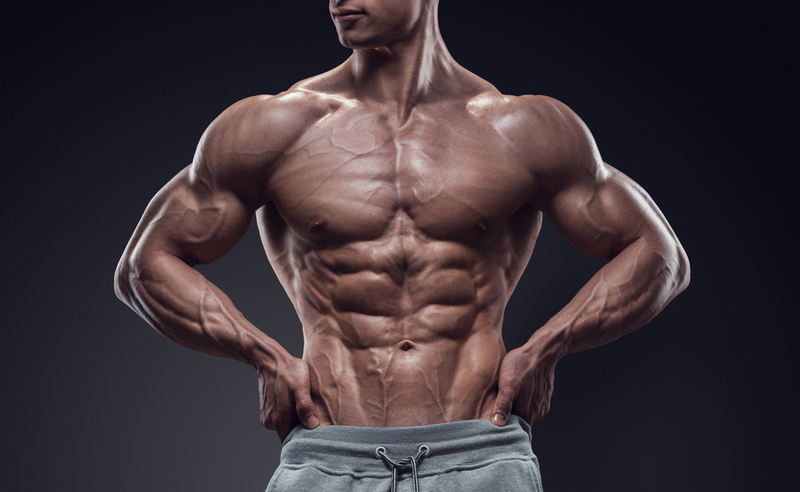 Is it possible to build muscle mass while in a calorie surplus and cutting body fat? Yes, it is, but the muscle gaining is painfully slow in moderate trainees and just not worth the effort most times. Muscle growth will always be optimal when you’re eating enough calories to promote your new muscle gains. This doesn’t mean just eating anything and everything to get enough calories. You want to make sure you’re consuming adequate amounts of protein. A simple and effective recommendation is to consume about 1 gram of protein per pound of body weight. So if you’re a guy who weighs 175 pounds, you should be consuming-yup you guessed it- 175 grams of protein, minimum. Your weight training routine should be based on sensible programming that hits each muscle group a minimum of 2 times per week and provide sufficient amounts of volume (Volume=weight x reps x sets). A good rule of thumb is to train with weights that allow you to get 40 to 70 reps per muscle group in each workout. So if you’re training chest, a good approach would be to hit 3 different exercises such as bench press, incline dumbbell presses, and machine chest flies, and do 3 sets of 5, 3 sets of 8, and 2 sets of 12, respectively. The majority of your energy should be spent towards the heavier compound moves such as heavy presses, heavy rows, and squats, and the rest of the workouts can incorporate higher rep ranges. Point of fact: You want to get stronger in all of your lifts, especially the heavy compound lifts. This doesn’t mean you have to increase the weight of your exercises by 5 or 10 pounds every workout, but you want to be making progress in strength over extended periods of time. If you’re repping out 225 on bench press and a year later you’re still doing the same amount of weight for similar reps, I can guarantee you that you haven’t gained any muscle mass. This doesn’t mean you have to become an amateur powerlifter and start training solely on improving your strength. But the longer you train with weights, the slower the gains will become. One way to ensure you keep making gains, even if it’s at a slower rate, is to keep progressively getting stronger at staple lifts in your routine. A lot of people like to say they go to the gym to make their gains. False. The reality is, you make the gains when you’re not in the gym. This all comes down to getting proper rest and letting your muscle and body recover and rebuild. Lifting weights is actually causing muscle to breakdown while you’re training, so too much training and not enough recovery will leave you spinning your wheels and stop the gains in their tracks. This is why it’s imperative to get adequate sleep every night (6-8 quality hours) and stay in a calorie surplus if you’re truly looking to optimize lean muscle gains. You might also benefit greatly from planned “deload” stages in your training where you reduce the amount of work you’re doing in the gym by lowering the volume and intensity for a week. Or even just taking a few days off from training. The most important factor here is you have got to remain consistent. The truth is, building a great physique takes time and will only be possible if you’re willing to put in the work. A lot of the time most novice and even moderate trainees will become discouraged when they stop making those rapid newbie gains. To get the most out of your training, you’re going to have to trust the process and stick to the above mentioned fundamentals to really see long term progress. Here’s the beautiful thing about making gains: it’s an art form. While the principles for gaining muscle mass are based in science, there’s still plenty leftover to make it an art. What do I mean by art exactly? It’s the ability to pick and choose which movements, exercises, and rep ranges work best for you. It’s being able to try out different methods and modalities and sculpt a workout that’s not only effective, but one that you enjoy. If you’re really into making muscle gains, you’re going to have to enjoy the training at some level, so take your time to find the style of training that works best for you. And remember, some workouts and exercises that work best for some people won’t always work best for you, so don’t be scared to try something new when you’re not seeing results. If you’re sticking to these 7 principles, there’s no reason why you shouldn’t be making gains for life. With a background in mechanical engineering, John Craven’s never ending search for “how everything works” and problem solving skills have carried over to helping individuals achieve their best physiques possible.